The Huntington Manor Fire Department responded to three working structure fires within about a five hour period on Thursday night into Friday morning. 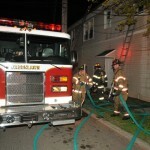 The first fire was reported at around 8:30 p.m. Thursday, at a house on Kilburn Avenue in Huntington Station. About 50 firefighters from Huntington Manor, Huntington, and Cold Spring Harbor responded to battle the fire that began in a bathroom and extended outside the back of the home into the attic. The blaze was brought under control within 45 minutes and there were no injuries reported, with the residents safely out when firefighters arrived. Firefighters rescued a pet dog from the basement unharmed and in good condition. The origin of the fire appears accidental, and is under investigation by the Town of Huntington Fire Marshal. 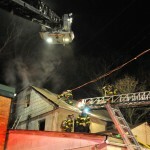 While firefighters were battling the Kilburn Avenue blaze, an alarm came in reporting a building fire at 1262 New York Avenue (above the Enrichment Center) and East Second Street in Huntington Station, at 8:45 p.m. Greenlawn firefighters standing by for Huntington Manor were dispatched to the scene, and assisted by Melville firefighters in battling the blaze. 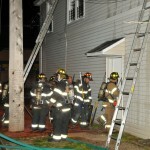 The fire was confined to a second floor apartment and was controlled within 15 minutes by 30 firefighters. Four residents were transported to Huntington Hospital by the Huntington Community First Aid Squad with smoke inhalation. The Town of Huntington Fire Marshal is investigating. The third fire of the night occurred early Friday morning at a building at 770 West Jericho Turnpike near Hartmann Hill Road in West Hills, at 1:43 a.m. Sixty Firefighters from Huntington Manor, Huntington, Melville, Greenlawn, and Cold Spring Harbor responded and had the blaze contained within 45 minutes. The fire damaged two first floor rooms, the roof and rear of the structure. There were no injuries reported and the Suffolk Police Arson Squad and Town of Huntington Fire Marshal are investigating.